queen of the castle recipes: Got too much leftover bread? Got too much leftover bread? Or at least I did have, until fellow bloggers graciously bailed me out this week with ideas for how to use it up. Bread crumbs. Bread pudding. Croutons, soup bowls, French toast. Bruschetta. Poultry stuffing. Soaked in milk and added to meat loaf. Since my Tuscan bread, made with minimal salt and baked at high temperature, gave us roughly the same gustatory experience as chewing through a wooden windowsill, I decided my best option, other than shellacking it and using it to weigh down the picnic tablecloth, would be to try bread salad. Panzanella is the official name of this recipe. It's a word I learned just yesterday thanks to both Kelly and Ingrid. leftover chocolate/cherry cream puffs for dessert, and called it dinner. You could also add a nice sauteed piece of chicken or fish and maybe a green salad, too, if you want. 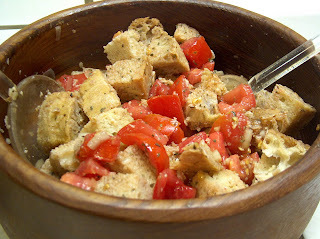 Full instructions for Panzanella can be found here, at Wild Yeast blog. You simply cube up the bread and set it aside to dry, make a quick vinaigrette out of kosher salt, olive oil, and balsamic vinegar, chop up a couple of tomatoes, 1/4 of a red onion if you have one (I used yellow), fresh basil (I used dried), then toss it all together in a wooden salad bowl you've seasoned with garlic and let it sit for a half hour before eating. And to the generous and helpful blogging community: Grazie. Those are great ideas -- I don't think I ever would have thought of them! A great makeover for leftover bread! Your cream puffs sound delish! LOL, I know what you mean about too much leftover bread. The bread salad sounds good; I've only had it in restaurants. Secondly, wow, those were wonderful ideas for using that windowsill bread! :) I read your post about it yesterday but didn't have any big ideas to share so I waited patiently hoping your readers would come up with something. :) Cream puff was definitely my favorite. Yahoo! I got a shoutout on one of my favorite blogs! Glad you enjoyed your panzanella (and that I didn't accidentally say "cloudy treadmill" or something in Italian)! Looks delicious! I remember reading about this dish in Under the Tuscan Sun and it made my mouth water. I'm going to try it. wonderful ideas! it looks delicious! Cool! So glad you liked it! (A good way to use up those tomatoes you have too!) Thanks for the shout out! You wanna hear something funny? While I've seen panzanella on MANY blogs I've never made if for myself as I'm not fond of onions or tomatoes! LOL! My salad would basically be bread and dressing! I've always wanted to try panzanella because it has some of my favorite ingredients in it, but ONE thing has kept me from it. I just.cannot.eat anything remotely soggy, so if the bread breaks down into mush, it would be a problem for me. Was it still textured? Please say it was, so I can order it the next time I'm in a fancy restaurant. Super ideas...I feel like bread pudding. Thanks for sharing! I've heard of bread salad but never had it. I'll have to try it! I had to laugh when I read this post. I had the same experience with the NYT artisan bread. Is that the one you made where you plop the dough into a hot cast iron Dutch oven? When I tried to eat it, my TMJ flared up big time! There's another one similar to the NYT recipe, but much easier and it doesn't break your jaw, and it's delicious. Sorry, you'll have to copy and paste. I don't know how to make the link thing in comments. Susan, I had to laugh back at your comment about the artisan bread that made your TMJ flare up. Not that painful jaws are funny, but a medical episode is not exactly what we expect when we embark on an afternoon in the kitchen with yeast and flour in the air. :) Thanks for sharing the bread link. It looks good. Julia Child's Pears . . .
And the book giveaway winner is . .